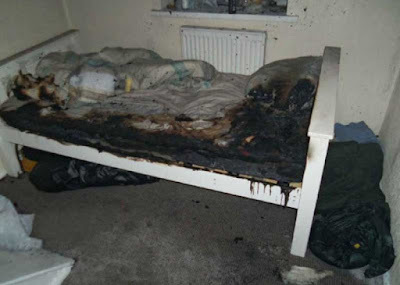 A man who set fire to his bed told 999 operators he was fed up with his neighbours. Bedsit resident Kyle Petho, 20, who knew two other 18-year-old men were in their rooms, was sent to a young offenders’ institution for three years and four months. Petho set his own bed alight and tried to spark a blaze in a hallway with a row of burning toilet paper rolls, Preston Crown Court was told. He then rang the emergency services and calmly said: “I’ve set the landing alight so they can’t get out.” Petho admitted causing arson with intent to endanger life at the multiple occupancy house in Leyland, Lancashire. Lancashire Fire and Rescue Service said Petho contacted the police on August 29 last year at around 11.30pm and confessed to starting the fire. When the operator asked if the occupants were in bed, he replied: “I don’t know and I don’t care.” He told the operator he would “take whatever punishment is coming my way”. One of the neighbours, Tyler Overfield, 18, heard the alarm and found the blazing toilet rolls when he opened his door. He managed to extinguish them and threw them outside. He and another resident managed to escape the property before fire officers arrived.